Authorities are investigating a hit-and-run crash that seriously injured a bicyclist in Sunnyvale (Oct. 24, 2016). 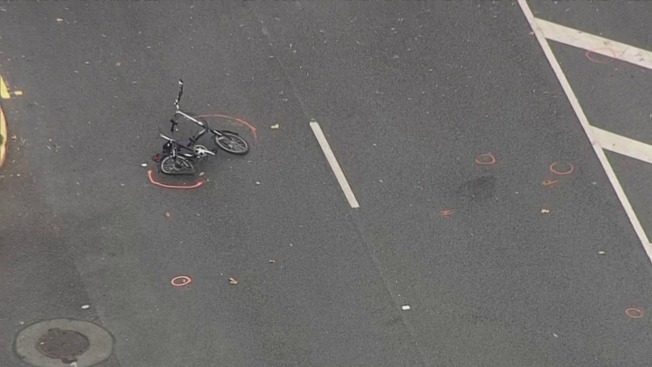 A bicyclist who suffered life-threatening injuries in a hit-and-run collision in Sunnyvale on Monday morning is in critical condition, a city Department of Public Safety spokesman said. A 67-year-old woman was riding her bicycle on East Fremont Avenue east of Sunnyvale-Saratoga Road, where a white vehicle hit her around 10:30 a.m., Department of Public Safety Capt. Shawn Ahearn said. Officers responded to the scene on a report of a collision involving major injuries and spoke with witnesses, Ahearn said. The bicyclist was transported to a hospital for life-threatening injuries, Ahearn said. The suspect driver sped away in a vehicle described as a white four-door sedan, possibly a late model Acura, seen heading east on East Fremont Avenue and south on Wolfe Road, Ahearn said. The car may have damage on its front bumper and hood area, Ahearn said. The vehicle and driver, who had dark hair in a ponytail, hadn't been located as of Monday afternoon. There was no video surveillance of the collision captured from neighboring businesses, he said. Investigators haven't determined whether drugs or alcohol played a role in the collision, Ahearn said. Anyone with information about the hit-and-run is asked to call investigator Dzanh Le of the Department of Public Safety's Major Accident Investigation Team at (408) 730-7109.